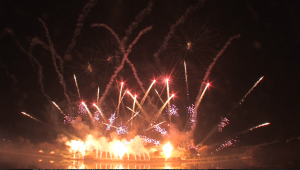 Vulcan Fireworks UK has been providing professional public fireworks displays for over 25 years. Working with our clients and local authorities we strive to make sure every precaution is taken to ensure our displays are both spectacular, and safe. We provide displays across the country and look after every detail from risk assessment to CAA communication. Be it a traditional town or village bonfire night, school celebration or the launch of a new building, you can rest assured that we will deliver a complete service. We offer a wide range of choreographed displays tailored to your exact requirements. We are renowned for our pyromusicals and offer complete production packages for your event. We can supply everything you need from crowd barriers to lighting and PA systems. Vulcan Fireworks can design stunning low noise firework displays which eliminate any large bangs and keep a highly visual show with vivid colours and effects. This is particularly suitable for venues where the level of sound needs to be reduced or for young children enjoying their first firework experience. We are quite used to delivering displays in parks, on pitches, from roof tops and on structures or even water. All of our effects are carefully selected for their purpose, fused and waterproofed before being packaged and transported to the firing site. All displays are prepared at our licensed firework factory along with any custom effects that may need producing. We offer free consultation, so why not take us up on that and find out what we have to offer !